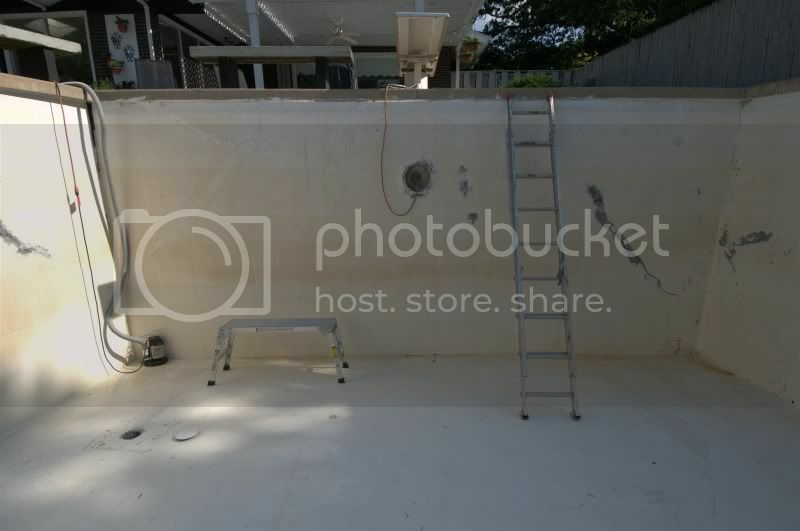 Does anyone have first hand experience installing a vinyl liner in a painted concrete pool? with no steps. 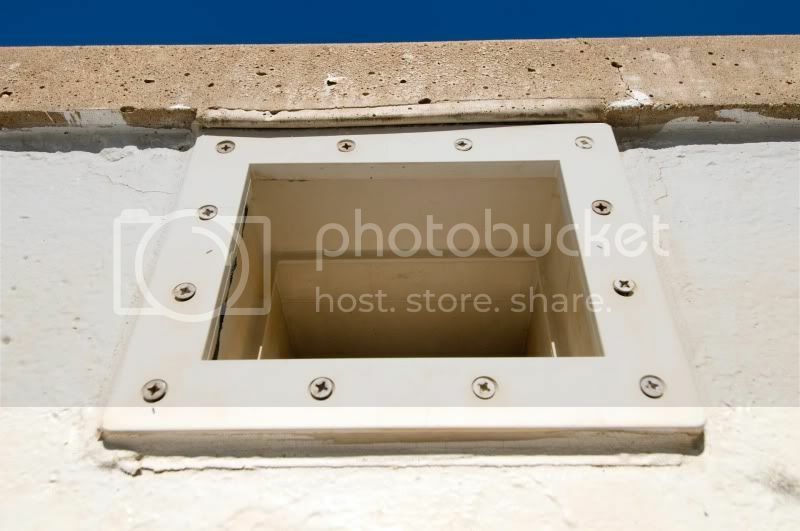 The bottom is flat and has a continuous slope to the deep end (it is not a hopper). 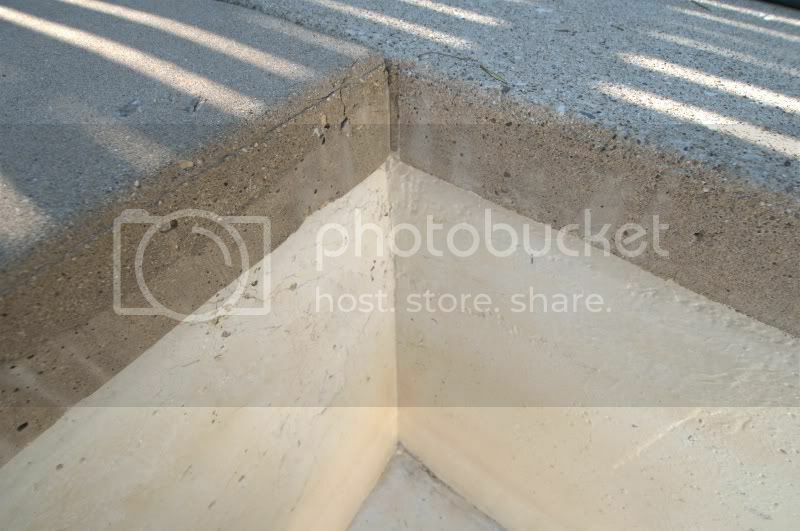 It is basically just a poured concrete box in the ground similar to a basement for a house. I think converting to a liner may be the cheapest solution. 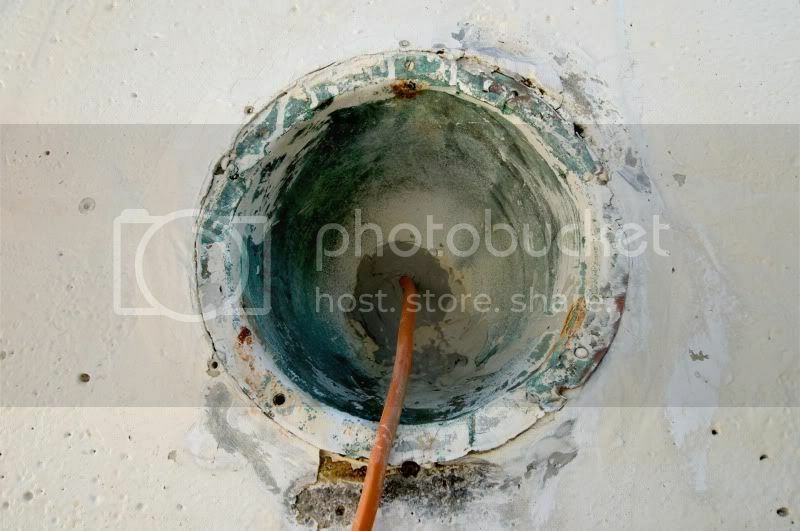 I know I need to convert the return fittings, main drain and light to work with a liner. My existing skimmer box already has a face plate for a liner, so that will save some work. I have also started researching the aluminum channel which holds the liner in place. and is happy with the results. I will post some pictures if anyone has some interest. Pics are always a plus while trying to communicate around here so I would say post away! Sounds like an interesting conversion. Are you planning on doing most of the work yourself or hiring it out? A somewhat (not something to quote) guess would be a minimum of 4 to 5 grand. I know just replacing a liner for a smaller pool can be $3000 so your added size and extra work for conversion would definitely add up. There are others here from chicagoland so maybe they can chime in with a reputable pool builder's name for you to check out. I have talked to at least a dozen pool companies/technicians in the last few months and only 2 have suggested a liner as a viable option. Most do not have any experience with this and said they would not do it. Many others said I would not be happy with the finished product. The two actual quotes I received were for $8800 and $10,000. I know there is a lot of work involved, but that price is to high for me. A liner from In the Swim, which is made by GLI products could range from $1500 - $2500 depending on the pattern and thickness. 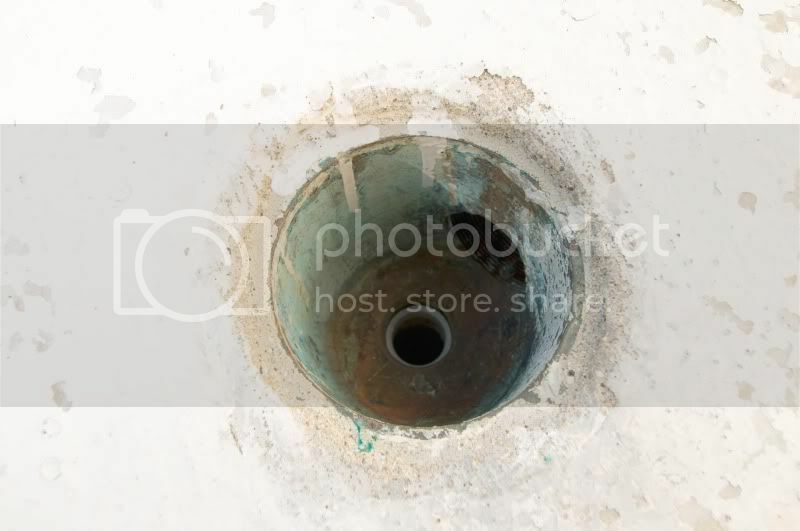 I think another $500-$1000 would cover a new main drain, return fittings, light ring, aluminum coping rail and fasteners. 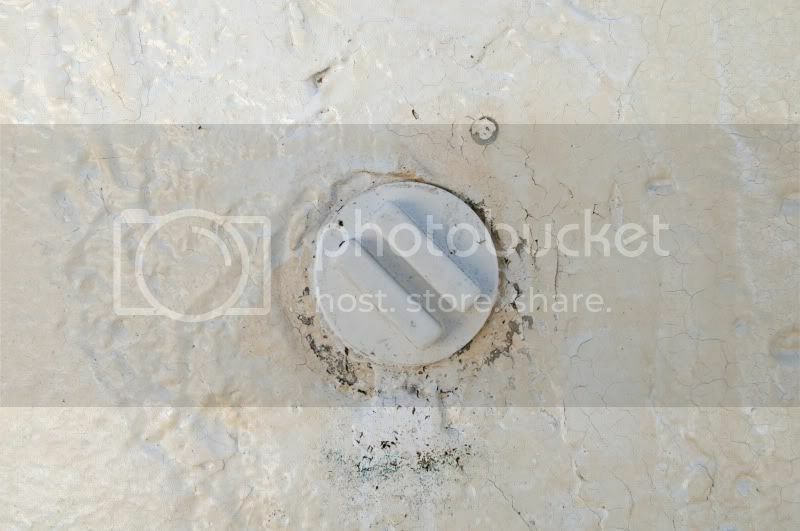 I am also thinking about fabricating my own adapter fittings and flanges out of 316L Stainless so I do not have to break out the old wall return fittings which are encased in the pool wall or the brass main drain. I think I could do the same for the light ring. I am trying to decide if I should try to repair the cracks and repaint or install a liner myself. a plan for installing a liner in the spring. Brad, simply discard the comments from people without experience as their comments are not valid as they have no knowledge. You should repair the cracks and don't forget to allow for the backing felt to go behind the liner. Carry out the work on site with heat welding of the liner. Alternatively ordering a standard liner will finish the pool and look stunning compared to restoring and retiling which can work out far more. If you go the liner route (it's certainly doable) I believe you should begin to develop a way you can "cove" or curve the corners and the point where the side and walls come together. First, A custom liner can be made to any specifications but they really have some stretch in them and trying to fit the 90's exactly into place can be really troublesome. The curves can give you a nice radius that will make your new liner fit perfectly. Secondly, that sharp 90 degree angle is a real PITA to clean.....either manually or with an auto-vac. 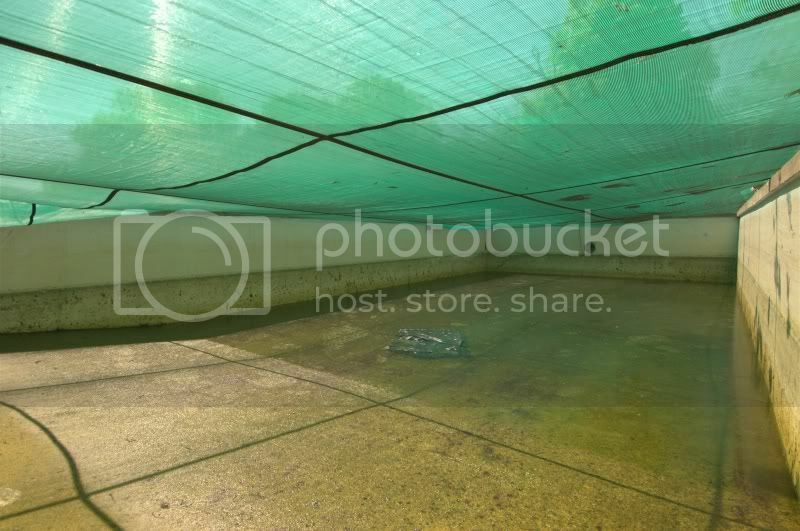 It's the perfect spot to develop algae. I have the matching younger brother. It's in the midst of being reserected. Yes, this shape lends itself very nicely to liner conversion. In my 13 years in liner manufacturing, hundreds of these have come across my desk. It's called a constant slope pool. They sell front mount liner track that you screw into the wall all around the pool. They come in 8' lengths and cost around $20 each. Be careful though--most liner manufacturers don't know how to make a liner to fit this style of pool. They tend to use their standard shrink formula which takes way too much material out of the liner and offers a horrible fit and a reduced lifespan of the liner. If you use a reputable liner manufacturer you don't have to worry about coving the bottom. I'm not a big fan of that idea anyway. Seems completely unnecessary. 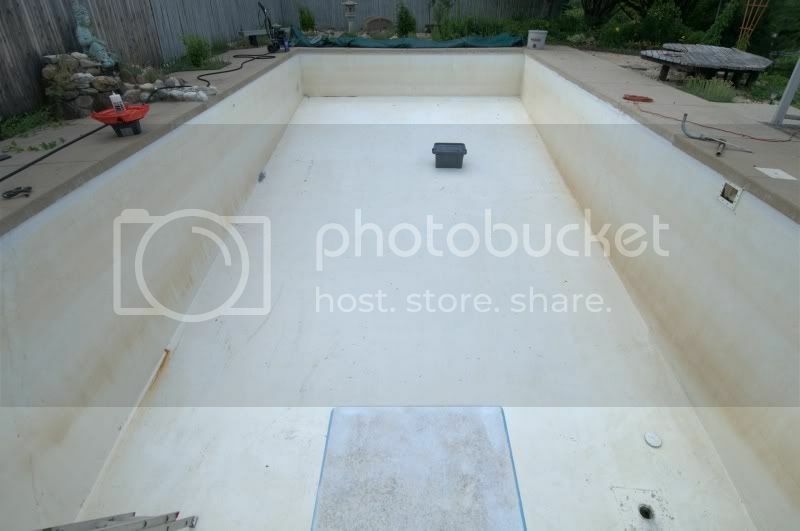 After all, aren't 99% of all shallow ends of vinyl liner pools just like the deep end of this pool? I don't know what you would need to convert the fittings to accept a vinyl liner; it's outside of my area of expertise. It seems like you have that covered though. So, in closing, I recommend leaving the bottom as-is and make sure to use a liner manufacturer with a solid reputation. but unfortunately is not within my budget. had installed a liner a few years ago. The liner looked good, but the pool was a different style. 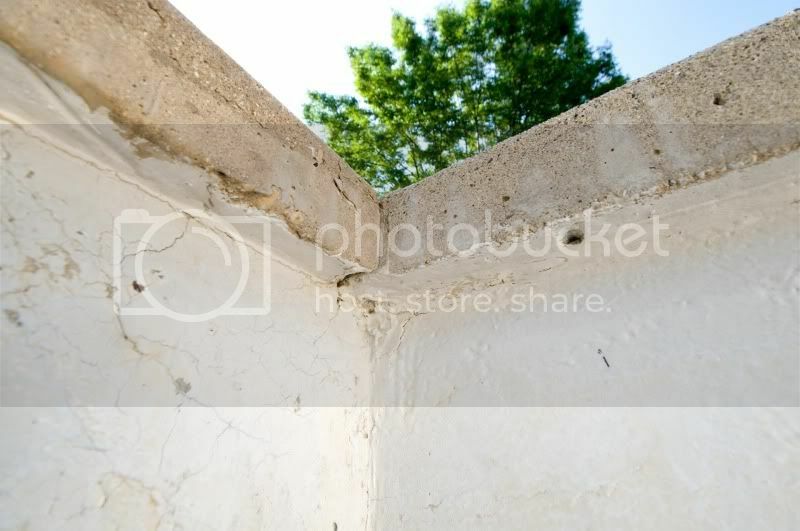 The walls were steel with a vermiculite floor and the corners had a radius. I think his price is reasonable, but I am still undecided about the liner. like mine in person, with a liner installed. You don't need to worry about the corners popping out of the track--once they are in they are hard to get out. Other sections of the bead will pop out before the corners do. Make sure you use aluminum liner track instead of plastic though. It is common for bulging to occur in square and 6" radius corners. A few liner manufacturers use a special technique to minimize this effect (I really only know of one other). Bulging isn't the end of the world though. If it is very bad then the liner will fail prematurely, but if it is only an inch or two it is inconsequential. As long as the pesky little kids don't try to poke their finger through the vinyl, you'll be fine. sidebar: my father-in-law's liner is over 30 years old and the corners bulge out quite a bit and haven't failed. At this point, I am planning on just fixing the cracks and then refilling with water before winter. with epoxy and/or hydraulic cement and some have been injected. The repairs have all re-cracked. empty for almost two. 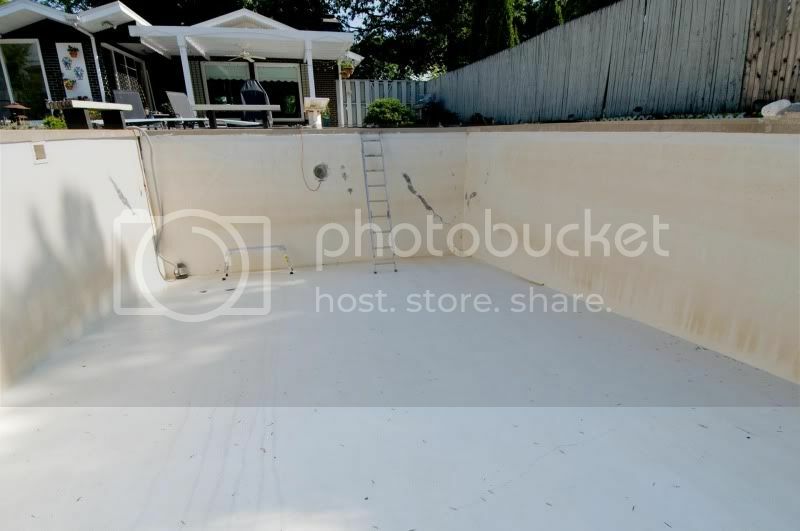 I know that the previous owners were old and did not use the pool much towards the end. I would guess the repairs are at least ten years old or more. 1) Hydraulic cement: A lot of folks have recommended this, but I am not completely sold. I think it will just crack again, although I think this is the cheapest option. Both are a two part 100% solids epoxy and are expensive. My pool walls and floors were separate pours, so there is a cold joint/crack in every 90 degree corner. are filled with epoxy, but are cracked in many areas. heard of these products. They said whatever they use on the walls they would use in the corners as well. Maybe I am over thinking all of this and should just use hydraulic cement on everything and call it a day. I am hoping that if I use the right product, I won't have to do this again anytime soon. Has anyone used these products? Any input or advice would be greatly appreciated? Unfortunately there is not one clear cut solution. I have no experience with the epoxies, though they sound like they'd do the job. I would use Waterplug or Thorite because I have lots of experience working with hydrolic cement.